About a week ago, I spotted this recipe and pencilled it in for the end of February. After testing it for the first time, I sent the draft to mum for her to try. Her pupil declared it the best cake she'd ever eaten and asked to take some home for her parents. They made the same claim. It seemed cruel to keep the recipe under wraps for a month. Besides, it's the perfect way to celebrate the end of January. I found the recipe in Signe Johanson's fantastic book from last year, Scandilicious Baking. I've only tried two recipes so far but they've both been excellent. Signe notes that this is "the quintessential Scandi cake". In an inspired move, she adapts the tradition by adding salt to the topping. After my first test, I decided to toast the flaked almonds - I think the texture and flavour is better. Toscakaka is essentially a simple whisked sponge topped with a gooey caramel almond topping that seeps into the cake and hardens on top to a crunchy praline. The edges, in particular, are irresistible. It reminds me of the famous Chez Panisse Almond Tart - and that's a very good thing. The only difficult part is persuading yourself to leave the topping alone instead of picking bits off and then, ashamed by your uncouth behaviour, trying to make it look like you didn't. In Signe's book and my other book on Scandinavian baking, Puccini's opera 'Tosca' is suggested as a source for the name. You can watch the Royal Opera House's 2011 production online - I'm listening to it as I write. The second half of the name also caught my eye. 'kaka' is the Swedish word for cake, which is the same as the original Old Norse word (Old Norse is the medieval ancestor of Swedish, Norwegian, Icelandic and Danish). Though the etymology is still debated, it is thought that our word 'cake' was borrowed from Old Norse in the 13th century, like many other common words (medieval loanwords from French, Latin and Norse were my favourite part of my brief time studying the development of English). 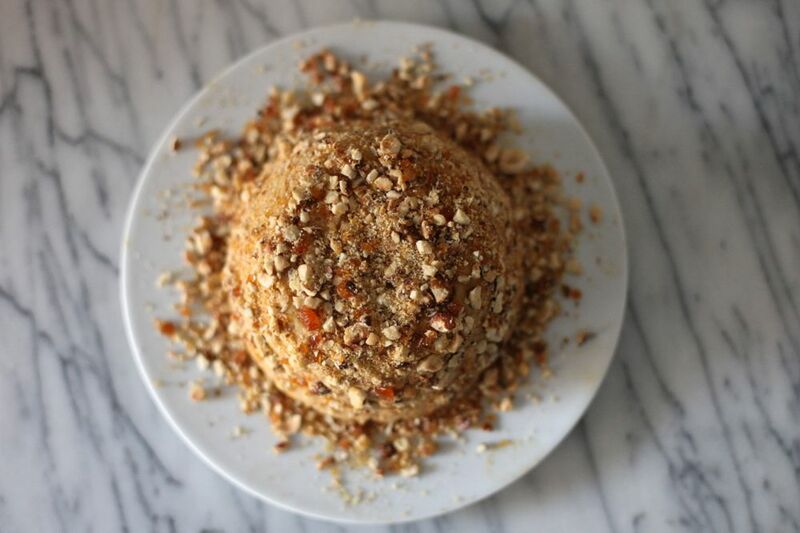 At that time, cake would have meant a yeasted bread, not a light, fluffy sponge created by whipped eggs and baking powder, cloaked in buttery caramel and crisp nuts. 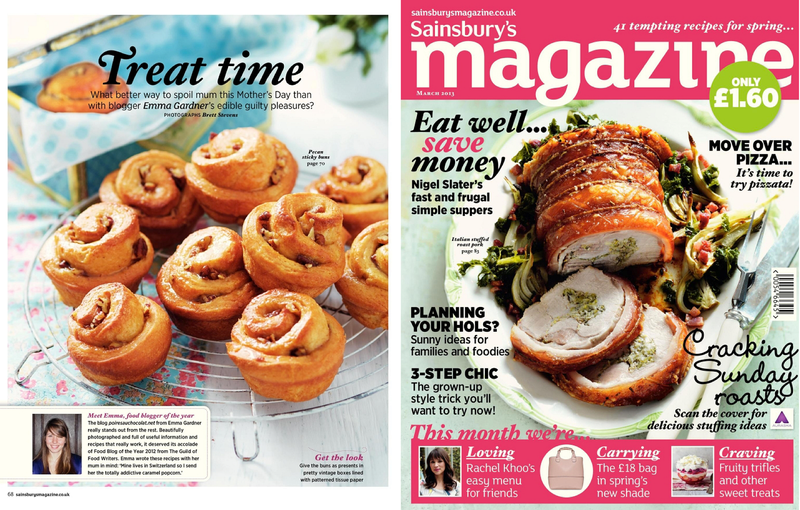 1/ My first ever proper recipe feature is out in the March Issue of Sainsbury's Magazine! I've known about this for about nine months so it's amazing to finally see it in print and get to show you. It's crazy to see my recipes in a magazine-style shoot, without the context of my writing and photography. You'll find the feature on pages 68-70 and there's another little bit with me on page 7. 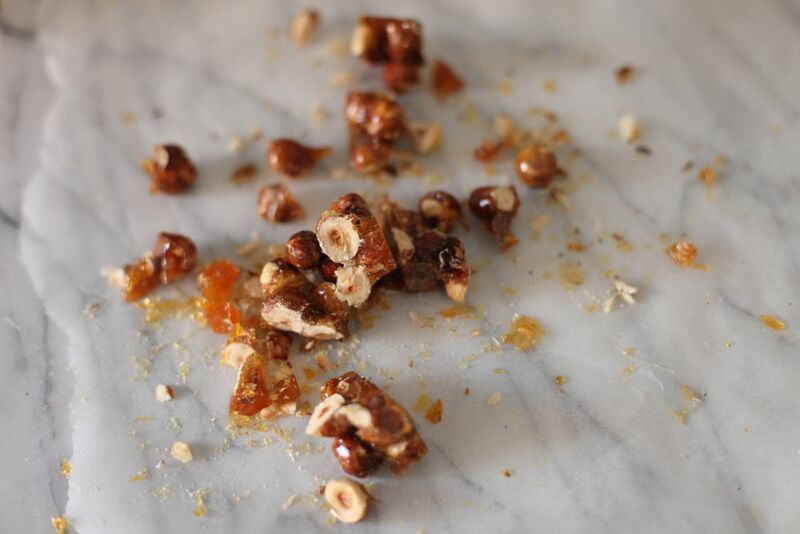 The are three recipes: pecan sticky buns, cocoa-rolled passionfruit truffles and proper caramel popcorn. 2/ I've been reading and revisiting a lot of my food books recently. I thought it'd be good to collect my favourites somewhere. In the end I made a Pinterest board (it's easy to keep adding to and links to amazon). You can find it through the photo link on the sidebar (the photo is of some of my food bookshelves) or here. I'm including recipe-based, memoir, history and reference books. Preheat oven to 160C/320F. Grease a deep 9" round tin (preferably with a removable bottom) and line the bottom with baking parchment. Stir the lemon juice into the milk and leave to sit (to make buttermilk, you can replace with 75ml if you have it on hand). Toast the almond flakes in a oven tray for 5-7 minutes until they're a light golden brown, then set aside. Melt the butter for the cake in a medium saucepan then pour into a bowl and leave to cool (keep the pan to use later). Whip the eggs, sugar and vanilla together in a stand mixer on high for 5 minutes (time this if at all possible), until the mixture is a creamy colour and very thick (when you remove the whisk, the trail should stay visible for at least 5 seconds). While it whisks, sieve the flour, baking powder and salt together. Sieve 1/3 of the flour mixture over the egg bowl then gently fold in with a big metal spoon or large spatula (see this video to see how). Drizzle half of the milk over the top and fold in. Repeat with the next 1/3 of flour, the rest of the milk, then the rest of the flour. Finally drizzle half of the butter over the top, fold in, then repeat with the remaining butter. Be very gentle but thorough, scraping the bottom - it's easy to get little pockets of flour but you need to conserve as much volume as you can. Carefully transfer to the tin by scraping it gently out from as little height as possible. Bake for 25-30 minutes until golden and set (a toothpick should be able to be removed cleanly - it needs to be cooked to support the topping). While it bakes, make the topping. Place the butter, sugar, milk, salt and espresso powder into the saucepan and stir as the butter melts. Keep heating for a few minutes - it should bubble and thicken slightly. Stir in the almonds and set aside. When the cake is ready, turn the oven up to 200C/390F, remove the cake to a rack and spoon the glaze over the top. Spread the almonds out into an even layer. Place back into the oven and bake for 8-10 minutes until the glaze is darkened and bubbling. Cool for a five minutes then slide a knife around the edge of the tin to loosen the sides and remove the cake to a rack. Best eaten once it's cooled to room temperature, though I have to admit to trying a warm slice with a scoop of vanilla ice cream. It keeps well in an airtight tin for two days and is still alright on the third. *Coffee isn't a traditional addition but I think it's delicious. Up to you. Last weekend, I gave a friend a box of Baileys truffles for her birthday. I've made them a few times - I adapt my favourite Muscovado Truffles recipe by using 190g double cream with 75ml Baileys and light brown sugar. They're a tad softer than the usual ones and melt the moment you bite into them. As I was rolling them between my cocoa-stained hands, I started thinking about other types of truffle I could make. I want to try some white chocolate and raspberry truffles using the freeze dried raspberries I bought recently. But first - champagne truffles. The milk chocolate ones, cloaked in a crisp shell with a dusting of icing sugar. I'm particularly fond of them. After some experimenting, I discovered that you need a champagne/cream ganache filling, rather than a champagne/water one. I thought that the cream might be obscuring the flavour of the champagne - and milk chocolate is already creamy - but it tasted weak without. Champagne truffles need to be rich and luxurious. I don't drink much these days, so I use alcohol sparingly in desserts. The key is to use enough so you can recognise the flavour but not so much that the alcohol overpowers everything else. If you want a stronger punch you could try replacing some more of the cream with champagne or even add a touch of cognac or brandy. I also tested the shell with tempered and untempered chocolate. The tempered ones did crackle beautifully when you bit into them but I don't think it's crucial. If you know how then go for it but I don't think it's worth learning just for this. The icing sugar coating means you're not looking for a shiny or streak-free finish anyway. The truffles are at their best the day they're made. If the chocolate is tempered, they keep in a container at room temperature for about a week (though I've never managed to keep them that long...) and if not, they'll last in an airtight container in the fridge for a few days. Finally, I know of two methods for dipping truffles. You can use a fork to lower the truffle into the chocolate, push it around until it's covered, then tap the fork to remove excess. The fancy forks you can buy have fine prongs so the chocolate drips off easily. You can also improvise and bend a few spokes back on an old, cheap table fork or snap them off a plastic one. I find with truffles like these where the filling is quite soft the fork can dig in and ruin the shape. In the second method, you smear a tablespoon or so of melted chocolate on both of your palms, then swirl the shaped truffle around until it's fully covered. You usually need to do this twice, as it can create a thin coating. But you get to smother your hands in melted chocolate. It's quite a feeling. Need I say more? Chop the chocolate for the ganache into very small chunks and place into a small bowl (if you're nervous about ganache or have some trouble, look at the ganache foundation post). Weigh the cream in a small saucepan and add the salt. Place over a medium heat and keep an eye on it until it starts steaming. Pour the cream over the chocolate and leave to sit for a minute. Stir until you have a thick, smooth ganache with no lumps of chocolate left. Add one tablespoon of champagne and stir it in as it fizzles, then repeat with the other tablespoon. Cover and chill in the fridge for three hours until set. When it has set, tip the cocoa powder into a bowl and dust your palms. Take a heaped teaspoon of the ganache and toss it lightly in the cocoa to stop it sticking, then form it into a sphere with your palms (don't worry if it's not perfect). Place onto a plate. Repeat for the rest of the mixture. Place back in the fridge to firm up for at least 30 minutes. When you're ready to dip, place some baking parchment on a plate and sift the icing sugar into a shallow bowl. Roughly chop the chocolate and place in a bowl set over a pan of barely simmering water. Heat, stirring occasionally, until fully melted. Temper if desired. If not, let it cool anyway - if it's too hot, it'll melt the filling. When it's room temperature, dip the truffles one by one - either by the palm rolling method or with a dipping fork (if doing two coats, set onto the paper then dip again once set - in a cool kitchen they'll be ready by the time you've done the rest). When coated, drop into the icing sugar bowl and roll around until fully covered. Once the chocolate has set up a bit, transfer to the plate. Continue until you've coated all the truffles - if the chocolate starts to solidify, briefly warm it up over the pan of water. If the chocolate isn't tempered, chill in the fridge for 30 minutes or so to fully set. Eat at room temperature. You will have a little bit of dipping chocolate left (as you need plenty to coat them) - scrape it onto a bit of baking parchment (if it's started to set, warm the chocolate up a bit first) and leave it to cool so you can use it for another recipe. *I know it's a small amount to open a bottle for. I bought one of those mini bottles so I only had a little left to share. Or you could open a big one and have a party. It's been snowing all day in Oxford. I spent most of the day in the kitchen, watching the flakes fall and gather outside. I've made this pound cake four times in two weeks. It's simple but shockingly good. Brown butter usually ends up as a background to other flavours, which is a shame (though I'm guilty of using it in all sorts of recipes). This cake keeps really well in a tin and freezes beautifully, as well as being both robust and fluffy. When I first set about converting this cake from the original olive oil version to butter, I realised I had no way of working out how much solid butter I needed to create the required volume of liquid brown butter. Guessing seemed a bit... boring. Guessing also wouldn't help me the next time I needed to do it. So I spent my Sunday afternoon browning most of the butter in our fridge, armed with a calculator and the scales. On the butter packet it should tell you the % of fat, protein and so on. The fat is usually around 82% (I believe it has to be 80% to be classed as butter) and the others total about 1%. This is what will be left when you've browned the butter and the water has evaporated - so for 100g of solid butter you'll get 83g of brown butter. After experimenting, I worked out that the density of brown butter is 0.93 g/ml (mass/volume, 93g of brown butter is 100ml). I've tried it out a few times and it's always worked. So, erm... yes. For those of you who want to try swapping brown butter for oils in recipes, no need to guess. Place the butter into a big pan and set over medium heat. Keep heating until you have brown butter (see this post for more detail/a step-by-step). Pour into a bowl and leave to cool - it needs to be room temperature. If there's any foam still lingering, spoon it off. Preheat the oven to 180C/350F. 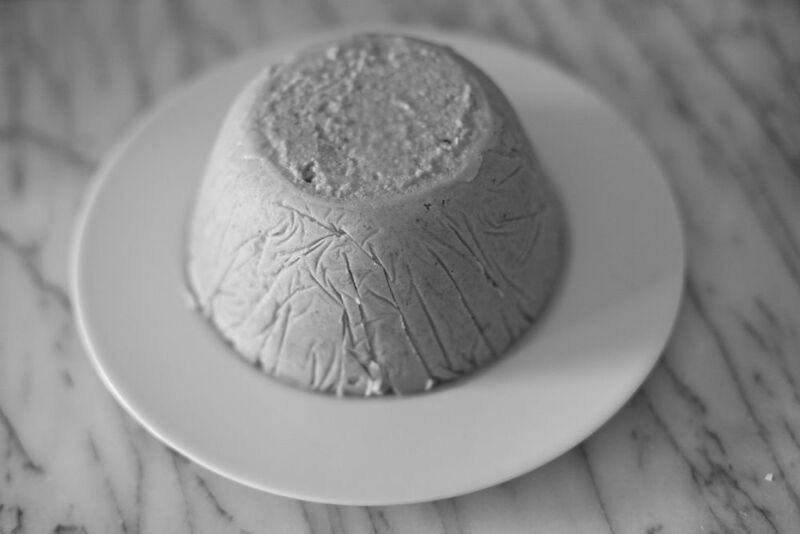 Either line a loaf tin (around 9"/23cm long) or carefully grease a round/decorated tin (the one shown is about 8.5"/21cm across). Scrape the cooled butter into a stand mixer bowl and add the sugar and salt. Beat together until creamy, then add the eggs one by one, beating in between. If it curdles, don't worry - that's normal. Beat on medium-high for 5 minutes (do time this, it makes a difference) until pale and thick. Sieve the flour and baking powder together. Tip a third into the mix and stir together on low. Slowly add half of the milk and briefly beat. Add another 1/3 of the flour, the rest of the milk, then the rest of the flour, combining in between. Add the vanilla and beat together one last time. Scoop into the tin and spread out. Bake for 45-50 minutes until a toothpick comes out clean and the cake is a deep brown. Leave to cool in the tin for 5 minutes then turn out onto a rack. Best eaten once cooled. Keeps well in a tin for a few days and freezes extremely well.